Vermont Gov. Peter Shumlin, Vermont Sen. Bernie Sanders, and David Orr closed the Slow Living Summit with a plenary focus on the positive actions being taken in Vermont, Ohio and what still needs to be completed nationally. The event held in the main theatre at the Latchis attracted members of the surrounding community as well as Summit attendees. 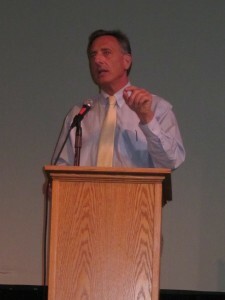 Shumlin (D), who has earned the designation as the 2011 Greenest Governor at the Opportunity Green conference in Los Angeles, Calif., began the afternoon event promoting the positive actions of Vermont in terms of focusing on the ideals of the Slow Living Movement. “If we keep doing what we’re doing, this conference won’t be an aberration but a way of life,” he said. The state is taking great steps with their “partnership with young farmers that want to work,” Shumlin said. He focused on changes to the state’s health-care system by instituting a single-payer system, closing the Vermont Yankee nuclear power plant, as well as lobbying and promoting changes to the transportation system. Shumlin touted Vermont’s low unemployment rate, the natural resources, and commitment to business ethics for future business environment and business entrepreneurs. He also answered a variety of questions from the audience on topics including one on whether to legalize industrialized hemp. 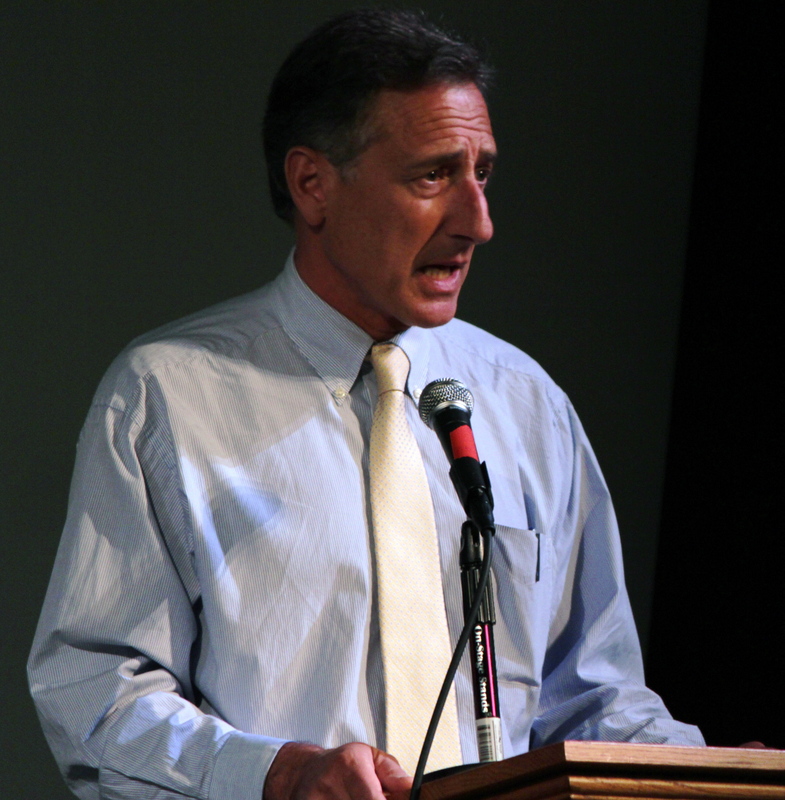 Shumlin hopes a law will pass the state Legislature to create a waiver for state farmers admitting though there will be trouble with the federal government. “We’ll fight that battle when we must,” he said. There have to be fast changes toward slow living, according to David Orr, the Paul Sears Distinguished Professor of Environmental Studies at Oberlin College in Oberlin, Ohio. He and Oberlin College have been working towards making changes in some of the more depressed area of the country’s Rust Belt. Orr presented the details of a variety of projects completed and planned for Oberlin College. The details of which can be seen at http://oberlinproject.org/. The goal has to be integrated sustainability, he said. Orr was the author of the Obama administration’s 100-days climate-action plan and he used a variety of statistics to discuss the problems with climate change, the lack of wealth distribution, and corporate advertising. “The backdrop of what we are doing is very political,” he said. 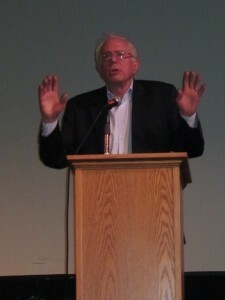 Sanders (I) focused on the politics of Slow Living and the challenges of changing the politics in Washington, D.C. The U.S. senator from Vermont focused on the problems of wealth distribution and what he termed class warfare by billionaires. Citing statistics on health-related diseases, he argued health care should not be a privilege but a right. He decried spending money to fund jails instead of combating childhood poverty and support a child-care system. “It takes bold souls to keep moving forward,” Sanders told the crowd.